The KaVo SONICflexÂ® 2000 L/N is an air-powered sonic scaler (5000 to 6000 hertz) that is available with or without fiberoptics. 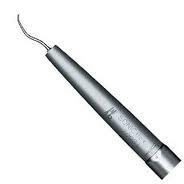 It is designed to fit onto KaVoâ€™s Multiflex coupling and may be used on a variety of dental units. Of course, you will need a Kavo Coupler if not listed with the handpiece. SONICflex is a premier air scaler to be used as a time and energy saver. Patients and hygienists alike will appreciate the quiet operation and speed at which it removes tougher materials safely and pain free.